Discover deep relaxation and balance techniques with a program designed by Rosie Radiator. Her tap dance classes focus on a deeper natural connection to the art through simple Loose Ankle Tap ® techniques. This releases a natural comfortable style in her clients. Since her historic dance across the Golden Gate Bridge on Labor Day 1976, Rosie and her Rad Tap Teams have set numerous Guinness World Records. They are still the current record holders for long distance unison tap dancing. Rosie discovered Loose Ankle Tap ® in 1969 and has been sharing it ever since. This real teachable tap technique sylibus for professional quality tap dancing is the actual technique used to produce those fast on the floor sounds that you can hear but not see. Just like the original tappers did. Featuring the amazing Supershuffle™. Honi Coles said, "This supershuffle is the first new thing I have seen in 30 years." Xtremetap™ (MIDI) on the musical floors at the Royce Gallery and in Tap Dance Room™ are Rosie's latest tap fantasy dreams come true, and she invites everyone to join in the fun! 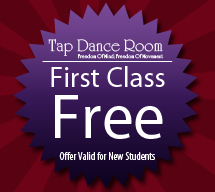 Contact us in San Francisco, California, for more information on our tap dancing studio and entry-level classes. The Tap Dance Room in San Francisco, California is the worlds only MIDITAP™ dance playground. It is part of the Royce Gallery complex at 2901 Mariposa Street with a MIDITap™ stage and studio. Highly experienced dance instructors teach entry-level and advanced moves to adults both young and old and groups of all kinds come to party and play on the musical floors for birthdays, team building and fun.